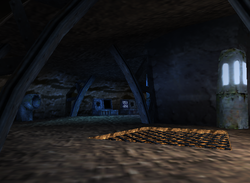 Hideout Helm is the eighth and final level of Donkey Kong 64. The lobby is accessible after the Kongs unlock seven padlocks on K. Lumsy's cage. To enter the level itself, the Kongs must have a minimum of 100 Golden Bananas. This is the only level in Donkey Kong 64 in which a Kasplat doesn't appear (excluding its appearance in the Battle Arena as well as the Kasplat that K. Rool sicced one of his giant Klaptraps on in a prior cutscene). After K. Lumsy's celebration, the mouth of Crocodile Isle is knocked open, and is where the Kongs can enter the lobby. The mouth can be reached by climbing up the ship, or if Tiny Kong uses her Monkeyport ability from a Tiny Pad. Hideout Helm functions as the control room of the Crocodile Isle and features the Blast-o-Matic. The Kongs must decommission the Blast-o-Matic before it fully charges, which King K. Rool plots to blast at Donkey Kong Island. The Kongs have a limited amount of time to meet this objective, which is shown from a timer. It counts down from ten minutes by default, but Snide can delay it by a minute for each Blueprint he has received. There are forty Blueprints in total, meaning that the highest possible countdown is 50 minutes. The timer does not take pauses, even when selecting a Kong from a Tag Barrel or on the "Try Again" screen shown when losing a Bonus Barrel challenge. If the timer runs out, the player gets a Game Over, and the associated cutscene plays. Hideout Helm is unique from the previous levels in that it has few collectibles. It only features five Banana Medals and a Battle Arena Crown, the former of which replaces the Golden Bananas. The Kong Family shops and Snide's H.Q. are not featured. There is only one pair of Bananaporters, the first pad being at the entrance and the other being in K. Rool's throne room. Hideout Helm has a throne room where King K. Rool is located in. It has a door depicting both the Nintendo Coin and Rareware Coin, which are both needed to open it. The final Boss Key and two Banana Fairies are located behind the door. It is possible to capture them without accessing the door, by using the Banana Fairy's Camera from the outer glass window. First, Lanky Kong must use his Orangstand technique to get up two slopes. A Kritter and Klaptrap come before the first one while a Klump precedes the second slope. Lanky then ends up in a circular, symmetrical room with another Klump and a Pineapple Switch. He must jump into a nearby Tag Barrel and have Chunky shoot the switch. Doing so moves down a stone wall and reveals another pathway. Here, the Kongs must jump between five vines over the lava. Another circular, symmetrical room appears afterward. Tiny Kong is required in this part, as there is a nearby Tiny Barrel requiring her to walk into a small pipe. This specific Kong Barrel somehow grants her indefinite Crystal Coconut energy. The pipe leads to the room with the Blast-o-Matic, and a gate door automatically opens for Tiny just before she exits the pipe. Tiny must jump into a Tag Barrel to swap out for Donkey Kong. He must walk behind the Blast-o-Matic and then use Gorilla Grab to pull a switch. This causes five DK stars to surround the Blast-o-Matic's second floor, and a Diddy Barrel also appears next to the Tag Barrel. There is a 60 second time limit for Diddy Kong to utilize Rocketbarrel Boost and fly through the stars. Doing so successfully opens five doors (which have a roman numeral on them, either 1-5) each leading to a room with a power generator for the Blast-o-Matic. Each room has a differently colored generator powering a power stream of the Blast-o-Matic with the same color, and must be deactivated by a Kong of the associated color. The generators are protected by a force field, which take away a quarter melon of the Kongs' health if touched. Every room (aside from Diddy's, which can only be reached with his Rocketbarrel Boost) is blocked off by a flimsy gate that can only be removed from Chunky's Primate Punch. Every room has a glass door that prevents the Kongs from entering, and each one can be opened by a Music Pad. These pads only appear individually, as the next one appears after a Kong has completed their two challenges. The challenges are done in the order of Donkey Kong, Chunky, Tiny, Lanky, and lastly Diddy. Each generator room either features one or two enemies. Donkey Kong's room features a Kritter, both Chunky's and Lanky's have a Klaptrap and Kritter, Tiny's has a single Klump, and Diddy's has two Klaptraps. After every power stream is deactivated, the Blast-o-Matic shuts off, the timer stops, and the door depicting K. Rool's head opens up. The active Kong must go down the newly-accessible hallway leading to the Control Room, which has the steering wheel, some computer screens, and the second Bananaport Pad. A single Klaptrap is at the left side, near the steering wheel, while a Kritter is on the right side. There is also a door depicting the Battle Arena Crown and the number 4 on it, indicating a minimum requirement of four Battle Arena Crowns to enter. This leads to the throne room. Just as the door opens, a cutscene shows K. Rool retreating into his airship, the King Kruiser II. The last objective is for the Kongs to obtain the Boss Key behind the Nintendo/Rareware Coin Door. Unlike previous words, the Bonus Stages take place inside a steel drum with K. Rool's head. Each Kong must complete two challenges, which then deactivates their corresponding color of the Blast-o-Matic. Each Kong wins a Banana Medal for completing both challenges. This section is possibly inspired from Ocarina of Time, where Link must be assisted by Sages to deactivate each colored barrier of Ganon's Castle. Left Barrel: Jump into the Barrel Cannon and shoot Donkey Kong into three of the four targets in under 30 seconds. Right Barrel: Rambi must defeat 18 Kritters while avoiding the electrical pylons in under 30 seconds. Left Barrel: In a twenty second time limit, Chunky (as Hunky Chunky) must break open ? crates with his Primate Punch until he finds a lone Kritter, whom he must defeat. Right Barrel: From the podium, Chunky has fire at five Kritters in 30 seconds. The challenge is easier with homing missiles, because the Kritters tend to move around. Left Barrel: Tiny has to Ponytail Twirl through three DK stars. She is on top of metal boxes and cannot touch the ground, otherwise she loses. The third star is at an extreme angle. After she touches the stars, Tiny has to Simian Slam a switch. Right Barrel: Similar to the left barrel, Tiny must bounce off mushrooms and Ponytail Twirl through three DK stars. She also does not lose from touching the ground. Left Barrel: Within 25 seconds, he must use OrangSprint to quickly navigate through a maze, hit a switch, and cross the finish line. Lanky must also avoid some Klumps and Koshas. Right Barrel: Lanky must shoot down three Mechanical Zingers, who get defeated from three hits each. The homing ammo makes the challenge easier because the enemies move around fast. Left Barrel: There are a lot of Kritters in the room. Within 30 seconds, Diddy has to defeat the Kritter who activated the switch, and then press it. A sound effect plays if he defeats the right Kritter. Right Barrel: Within 45 seconds, Diddy must use Rocketbarrel Boost to go up and fire at four up-arrow switches. Then he must go down, avoid Koshas, and Simian Slam on the blue switch. Location: In the Blast-o-Matic room, Diddy must use Rocketbarrel Boost to fly to the top of the machine where the Battle Arena Pad is located. K. Rool's laughter sounds as the countdown timer goes down. It plays more often as the timer nears zero. It sounds out at the 30 minute mark, the 20 minute mark, the 15 minute mark, the 10 minute mark, the 5 minute mark, and every minute mark after 3 minutes. Hideout Helm is the only level where the Tag Barrel theme is absent. This is the only level that does not have Wrinkly Kong doors in the lobby. The main theme for the level was originally composed as part of Mayahem Temple while it was going to be a level in Banjo-Kazooie, also while it was known as Project Dream. This page was last edited on February 26, 2019, at 20:36.